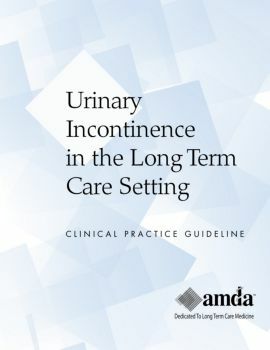 Urinary incontinence is one of the most common conditions among residents of post-acute and long-term care (PALTC) facilities, affecting about 55% of all such residents. The prevalence of urinary incontinence increases with age. Women are affected more than men. Although urinary incontinence is increasingly prevalent with age, it is not a normal part of aging. Urinary incontinence can adversely affect patients’ dignity and can contribute to depression, embarrassment, and social isolation. The annual cost of managing urinary incontinence in PALTC care facilities is estimated at $5.5 billion. Better identification of individuals who have a reversible urinary incontinence problem. More individualized approaches to urinary incontinence management. More effective targeting of staff resources to urinary incontinence management. Minimization of inappropriate use of diapers and catheters. Reduction in significant complications of urinary incontinence and urinary catheters.